Teeth by Tonight™, Teeth In A Day by James A. Vito D.M.D. Teeth by Tonight™ is a special and trademarked process that is unique to our office for the immediate replacement of damaged or missing teeth. We can deliver new dental implants, crowns, bridgework or a combination of the three in just a few hours. Teeth in a Day™ or ALL On Four™ is a similar procedure as Teeth by Tonight™. A patient with a mutilated or failing dentition is seen for a 3D CT scan where a plan is made for the removal of all their teeth and plan the design of the teeth position on the implant supported restoration. Once the plan is approved the patient is scheduled where teeth are removed, Dental implants are placed, and the dental implant supported tooth restoration is then attached to the dental implants as a permanent restoration. 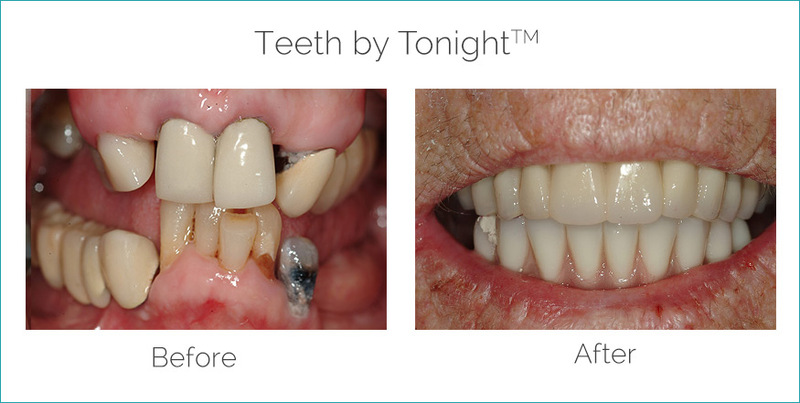 For further information on Teeth In A Day or Teeth by Tonight™ in the Philadelphia, PA and Main Line area, visit teethbytonight.com or contact our Implant Dentistry office today (610) 971-2590. For additional information, please visit Dental Implants in Wayne, PA.